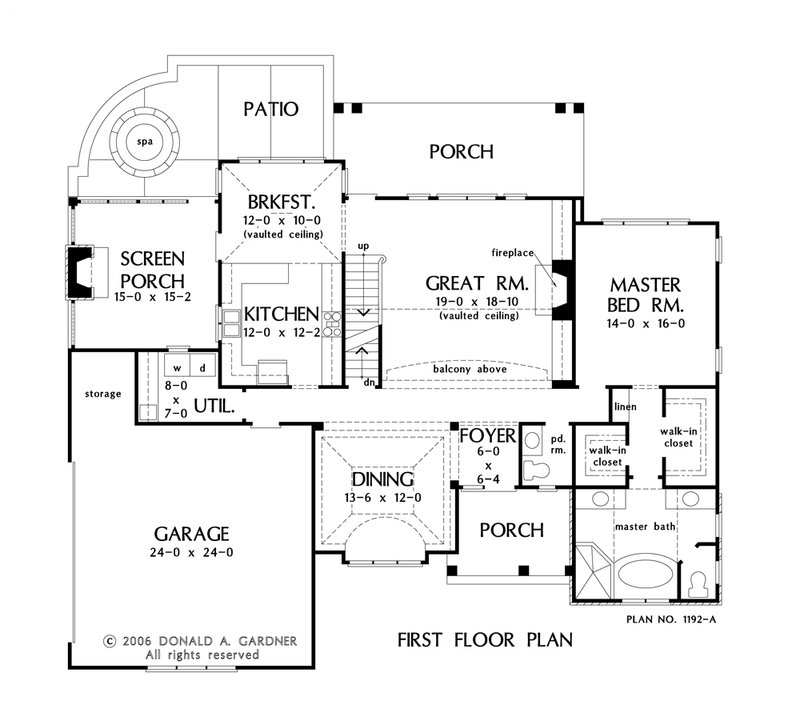 An abundance of arches and windows give this plan plenty of character. Inside, the foyer and dining room are a formal welcome into the house. The tray ceiling and barrel vault add impressive details to the dining room. The spacious great room features a wall of windows and built-in shelves that flank the fireplace. Adjacent to the kitchen, the breakfast room includes a vaulted ceiling and screen-porch access. Homeowners will also love the extra storage area in the garage. 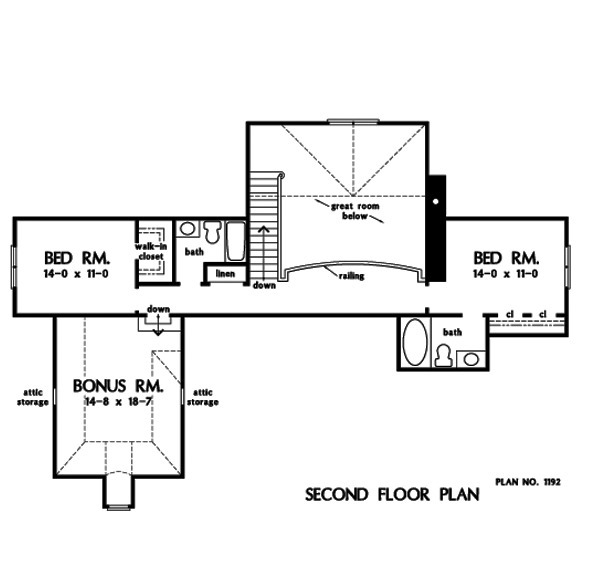 The master bedroom is on the first floor and includes his-and-her walk-in closets and a luxurious master bath. Upstairs, two large bedrooms each have their own bathroom and the walkway connecting the rooms overlooks the great room. A large bonus room awaits the imagination of the homeowner. 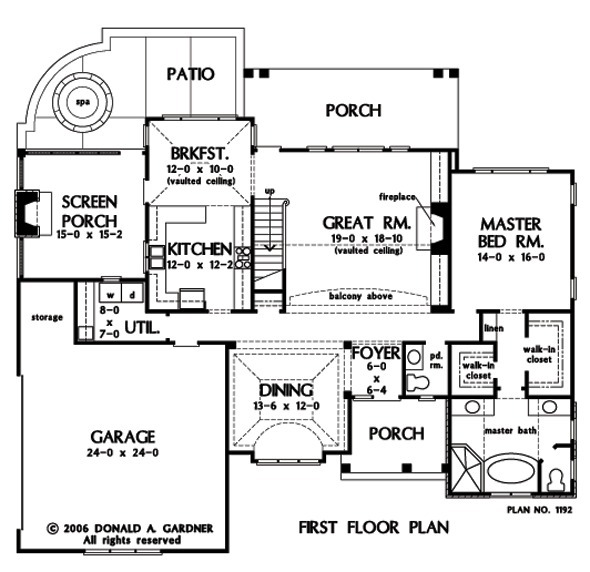 House Dimensions: 65' 0" x 56' 6"
Great Room: 19' 0" x 18' 0"
Porch - Rear : 24' 2" x 9' 4" x 9' 0"
Porch - Front : 11' 4" x 8' 8" x 9' 0"
Porch - Screen : 15' 0" x 15' 2" x 9' 0"
Balcony : 20' 8" x 6' 0" x 8' 0"
Bedroom #2 : 14' 0" x 11' 0" x 8' 0"
Bedroom #3 : 14' 0" x 11' 0" x 8' 0"
Bonus Room : 14' 8" x 18' 8" x 9' 0"
Breakfast Room (Vaulted): 12' 0" x 10' 0" x 12' 6"
Deck / Patio : 26' 6" x 14' 1" x 0' 0"
Dining Room (Tray): 14' 0" x 12' 0" x 12' 0"
Foyer : 6' 0" x 6' 4" x 9' 0"
Garage Storage : 6' 4" x 7' 4" x 0' 0"
Great Room (2 Story): 19' 0" x 18' 0" x 18' 1"
Kitchen : 12' 0" x 12' 2" x 9' 0"